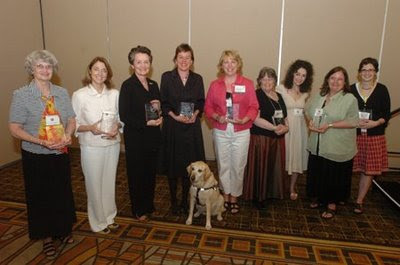 Left to right, this year's Henry Bergh award-winning authors: Barbara Cole; Mary Alice Monroe; Helen Wilbur; Beth Finke; Maribeth Bolts; Sue Ann Alderson; Me; Joanne Ryder and a very talented book designer of "Ape" whose name slips my mind (very sorry!). I was so impressed by these authors. Beth Finke is not only beautifully dressed in this picture, but had us all in stitches with her straight-up sense of humour about life with a seeing-eye dog. It was lovely to see Sue Ann Alderson, also from Vancouver and a talented author on Tradewind Books list. Vancouver has a very close community of children's book writers but I haven't seen Sue Ann in a few years, so it was especially nice to be reunited with awards in our hands. Mary Alice Monroe is the talented novelist of some beautiful books, including "Time is a River" which I borrowed from the North Vancouver Public Library and thoroughly enjoyed. Thanks to Joanne Ryder for reminding us all of the importance of frog appreciation in childhood"; Barbara Cole presented the true story of "Anna and Natalie" with a warm Southern Charm; author Helen Wilbur accepted the illustration award on behalf of artist Robert Papp for for "M is for Meow" and Maribeth Boelts' reading had us all nodding our heads. Yup, that's Joe Pentangelo, star of "Animal Precinct" on Animal Planet. 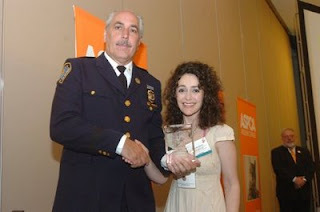 My nine year old was so impressed that I got to shake his hand at the ASPCA Awards Ceremony in June! Me too! know him too!!! Keep it up!